Cicada (Hemiptera) are delicacy in the northeast of Thailand. Cicadas have large eyes wide apart on the head and have transparent, well-veined wings. Many people around the world regularly eat cicadas: the female is prized as it is meatier. Shells of cicadas are also used in traditional Chinese medicine formulations. Dried Cicadas contain over 50% protein and are low in fat. 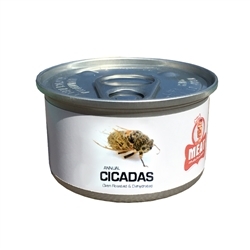 Our cicadas have been processed by oven roasting and dehydrating, no seasoning has been added. Cicada can be eaten whole or ground into a powder and added to any food to increase the protein content, they have a delicate nutty flavor. Net Weight 15g - Approx 10 large cicadas per can.